As plan_hash_2 is what baselines use, this means that baselines work happy with materialized CTEs. I’ve not checked the PHV2 is in the other examples you mention. Good to know. Thanks. Please post what you find. The point of this blog is that observing the PHV is not enough in corner cases like the ones I mentioned. Cheers! I just did a quick test and unfortunately the value stored in plan_hash_2 does not appear to include predicates in it’s calculation. Baselines don’t do anything to control how predicates are ordered either in 11g. 12c has the potential to improve that situation, but I’m not supposed to talk about that yet. 🙂 It’s cool that Baselines know about system generated names by the way. I hadn’t run across that before. Dang! I was going to do that. You should definitely do a post on SQL Compare! That is, two different sql_id, two different force_matching_signature, same plan_hash_value producing two different numbers of rows processed. As I started investigating SQLT, I thought it is worth to see what execution plan SQLT will show. The first interesting point is that sqltxtract for both sql_id show, as expected, the same plan hash value (2339135578), the same plan_hash_value1 (80535) and two different plan_hash_value2. This is very cool and extremely correct as far as the difference is located within the predicate part. However, the difference in the predicate part is not shown into the main report. The two executions plans seems to be identical from the execution plan point of view. If you execute SQLT COMPARE you should see the difference in predicates (if any). 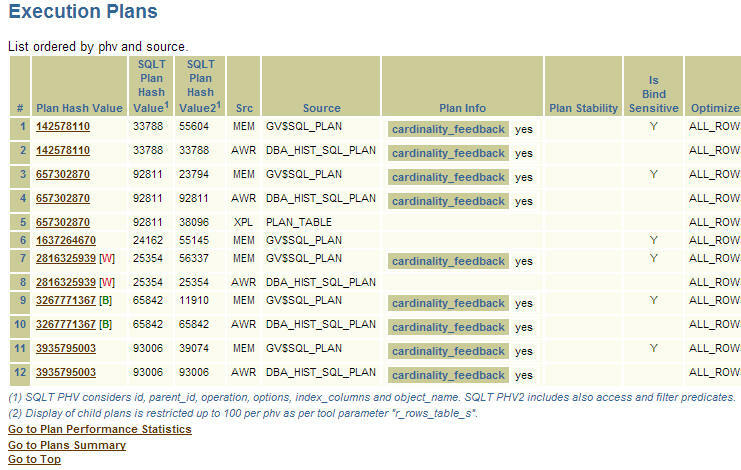 You can also look at the SQLT PHV1 and 2 out of the Execution Plans section on MAIN. Please send me both SQLT files. I don’t know if here is the rigth place but I have doubt about the information in the “Observations ” section. What the “is missing Peeked Binds” really means here ? A cursor that was parsed and executed without any bind ? Is it possible ?